Airport Madness 3 is progressing well. You may have noticed that the release date has been pushed back to June 2010. We learned from the release of Airport Madness 2 the value of thorough testing before release, and we intend to launch a solid game with hopefully no major issues. When you create an air traffic control game or simulation, you must build a great deal of “intelligence” into the aircraft. 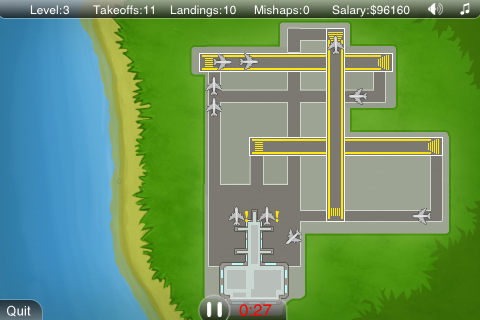 For example, if two aircraft are taxiing towards each other on crossing paths, how do they decide who- stops-for-who? What at first seemed like a programming challenge quickly revealed itself to be a trigonometry nightmare. For example, how do two artificial aircraft decide who should stop in the image shown here? The answer is, whichever aircraft has a smaller relative angle to the other shall stop. I almost had to phone up my Grade 10 math teacher to figure that one out. Creating this simple rule added a couple of weeks to our project. We also received a great suggestion from someone to incorporate pushbacks into our game, whereby an aircraft is moved backwards out of its’ gate before commencing taxi. However, the concept of backwards-moving airplanes threw a wrench into our formula above, since all of the relative angles get thrown out of whack when you reverse direction. As always, we developed a workaround to the problem. However, these things require time. You may be asking yourself, “Doesn’t air traffic control decide who taxiis and who stops?”. In reality taxiways are controlled, however parking aprons are not. In the real world of air traffic control, most of the “action” is on the runways and in the air. Controlling taxiways is generally kinda dull. 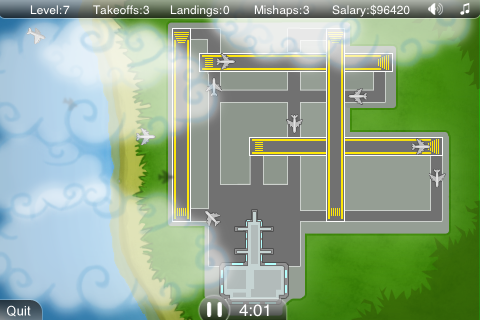 Like the earlier version of this game, Airport Madness 3 is about runway management including airborne conflictions. The apron/parking conflictions are left to the pilots to figure out. 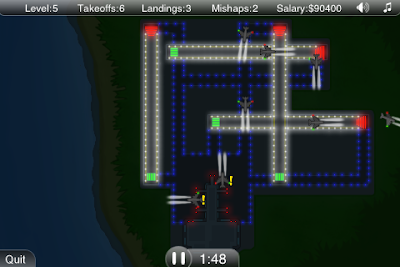 Airport Madness 3 has had a few other challenges, most notably the large resolution which increases CPU demand on computers. 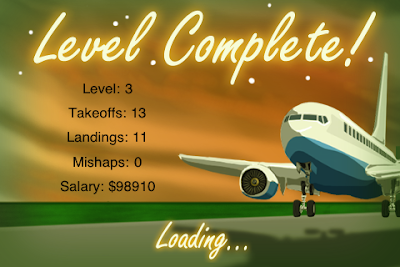 After building out the game’s foundation one month ago (a very basic no-frills single-level test platform) we noticed some performance issues as well as some unusual aircraft behavior. We decided not to move forward until these issues were resolved. I am pleased to say that these issues have been successfully eliminated and we are now moving forward with the addition of pilot voices, game options and other details. Please sign up for the newsletter above to be first in line for its’ release. 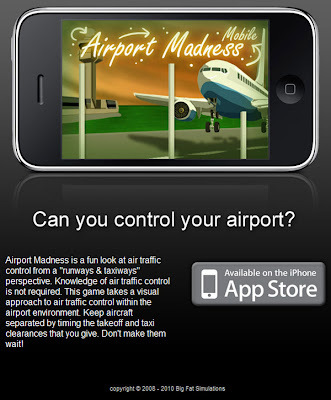 This entry was posted in airport madness 3 on April 10, 2010 by admin.